We have doubts and we haven’t even stopped for lunch—the halfway point. Our packs are heavy, with 5 liters of water, clothes, sleeping bags, sleeping pads, tents, cooking supplies. The first hour of the hike up Acatenango Volcano was straight up. It isn’t much better now. We stop for lunch at our halfway point and everyone throws off their backpacks and collapses on the ground. The lunch that is provided for me is the best thing I’ve ever tasted. There was cheese and spinach and bread, and whatever. Acatenango Volcano is about 14,000 feet to the summit. We start at about 8,000, in farmland. Corn, coffee, fava beans, macadamia trees cling to the hillsides. Our packs feel heavy at the start. The first hour is a harsh indicator of what is to come. In total, there are 22 of us including our two guides from Outdoor Excursions (O.X), based in Antigua. We stop frequently for breaks, the front group getting more rest waiting for the group anchored in the back by a guide. Our guides are both from New Mexico – exhibiting that Southwestern ruggedness that American folklore is so eager to point out. The hike is challenging. The lead group dwindles as time goes on. Nearing our campsite, in the Volcano zone, trudging through sand, wielding our walking sticks, we look like religious pilgrims marching towards the holy site. Our heads are down and we solemnly walk, out of breath, battered by wind, exhausted. We reach our camp, delirious. Stragglers continue to filter in, looks of disbelief on their faces. After a break, we set up our tents and organize all of the supplies that we shared in carrying up. With our packs left behind and our shoulders light, we now face the summit. The mood is cheerful at the start. We can see the end and we no longer carry the burden of our packs. But the weather is harsh. It was comfortable in the cloud forest, hot among the pine trees. Now, wind and mist whips us as it comes up the mountainside and then plunges back down the other. Visibility is nil. The soft sand is hard to negotiate and makes extra work for our fatigued legs. We reach the summit through the mist. If not for our guides, we wouldn’t even know we were on top of a mountain. 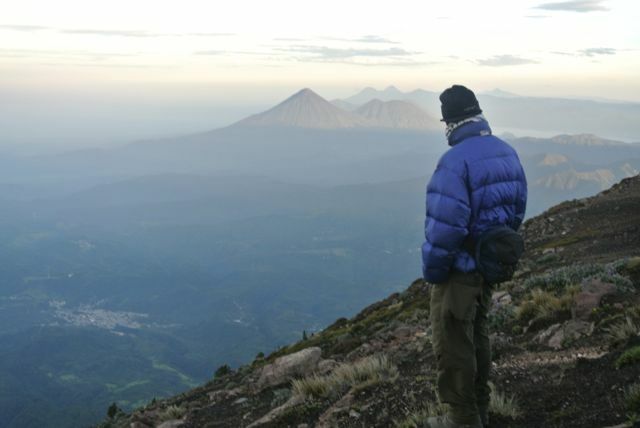 We linger for a moment, and then walk around the crater of Acatenango. A slight disappointment envelops the mood of the group. We descend back to camp for dinner. Dinner is inhaled. Cartons of red wine are passed around. Almost everyone is asleep by 8 pm. 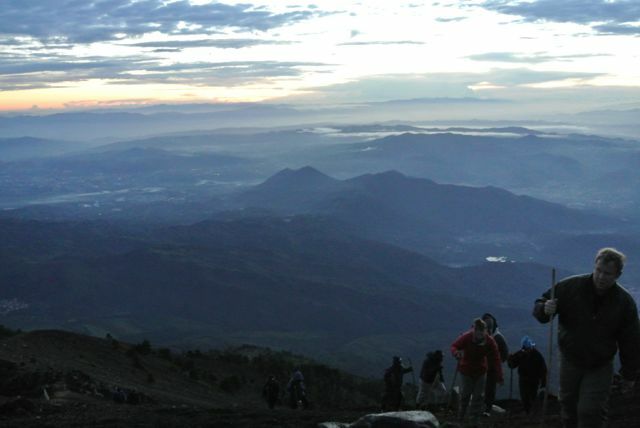 Around 4am a group of us wakes to visit the summit again before sunrise. The cold is harder to bear in our drowsiness. The summit is clear. We see the coastline over the clouds, Lake Atitlan, Tajumulco Volcano – Central America’s highest peak – in the distance. Fuego and Agua Volcanoes loom close by. We sit and watch Fuego smoke as the sun casts an enormous shadow of the still active volcano (pictured below). Small snippets of plant life color the mountainsides. Little yellow flowers sprout in-between boulders. We eat breakfast, break down all the tents, and pack our gear. Our packs are significantly lighter. Less water and food weighs us down. With our walking sticks we descend back down the mountain. Through the sandy volcano zone, down into the alpine and sub-alpine trees, and through the cloud forest. As I’ve previously expressed my boyish excitement about being in clouds, this is quite the trip for me. The climate is tropical, plant life abundant. The air is cool, but as in all parts of the mountain, moves swiftly. The sun is blanketed in clouds and the next moment it is exposed and burdensome. People slip and fall on their asses, but the march continues. Breaks are frequent, but the pace is solid. Cut your toenails before going. At the bottom we sit down and look up at the mountain we just conquered. It feels satisfying, but we are all beat. We load into the vans that take us back to Antigua. Chatter is minimal. Heads bob from fatigue. Our showers and clean clothes are a godsend. This entry was posted on June 20, 2013 by alexjparton. It was filed under Americas, Guatemala, Travel and was tagged with acatenango, Antigua, central america, fuego, Guatemala, hike, O.X., trek, volcano. I am jealous you got to be in the clouds…sounds like hard work though! Sometimes it’s good to have your head in the clouds. This time, it was worth it.